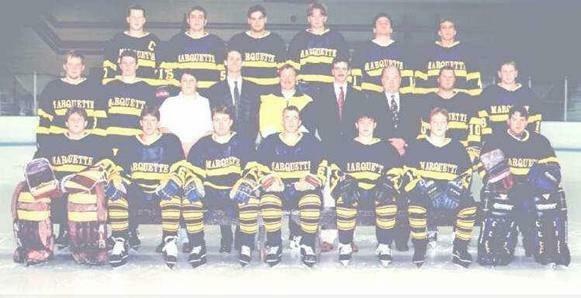 Interested in being apart of all Marquette Hockey Alumni news, events and team updates? Send email address to goldeneaglehockey@gmail.com and we will add you to our news email list!! 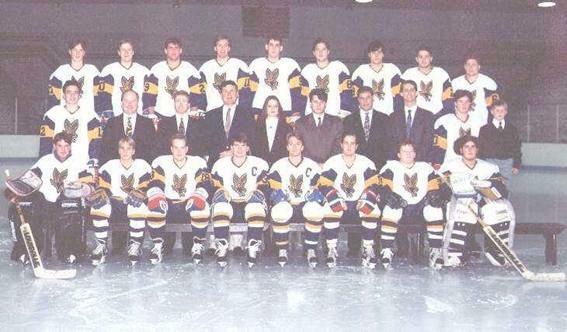 We are continually in the process of uncovering our history and the founding of the Marquette Hockey Club. If you have history of the Marquette Hockey Organization we would love to hear about it and add it to our great history. Please send an email to the team email: goldeneaglehockey@gmail.com. The following is information I collected concerning ice hockey at Marquette University in the 1930's. It is in reference to your Internet request for information on the history of ice hockey played at Marquette University. My Father, Earl J. "Tommy" Thomson was from Moosejaw, actually Caron, Canada. He had attended a small Canadian college for a couple of years about 1929 and 1930. He then won a scholarship to play goalie on the hockey team at Marquette University. Dad was on the "modified co-op" work program at Marquette, started in 1918. In that program students studied academics for 2 years and had academics studies combined with engineering related jobs (on alternating semesters ?) during their last 3 years. During the co-op work periods he acted as the City Engineer for the city of Moosejaw and also earned his private and commercial pilots licence. Dad played goalie for the Marquette Blue & Gold “Hilltoppers” from 1931 (1930-1931 season) to 1934. The hockey squad in those years practiced on outdoor ice as there was no indoor ice in Milwaukee. During these years, due to the weather, there was almost no ice. Practice was, therefore, extremely limited. Hockey was discontinued in 1934 due to still having no indoor ice or even consistent outdoor ice..
My Dad said that his scholarship to Marquette University was supposed to be an "all inclusive - full ride" scholarship, This turned out to not be the case. Thus Dad and his friends and teammates on the Marquette hockey team, Ken Hood, Pudge MacKenzie and Ozzie Wettlaufer all worked their way through Marquette as waiters in restaurants and other jobs during semesters they were taking courses at Marquette. I have my father's Marquette University yearbooks from 1932, 1933 and 1934. He graduated in Electrical engineering in 1934. He was a member of the Knights of St. Patrick and also of the AIEE engineering fraternity and graduated with a degree in Civil Engineering in 1934. 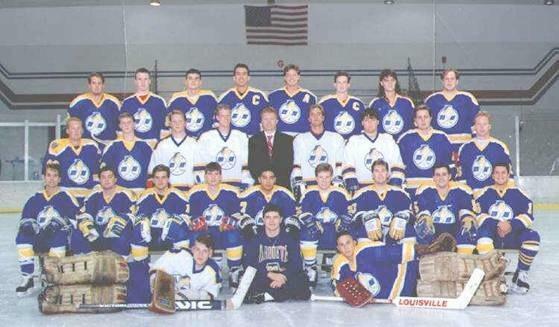 My Dad was elected as an All American hockey player at Marquette. I have his All American crest and I believe it has the date “1934”. In 1935 Dad and Pudge MacKenzie went to work for Burns and McDonnell Engineering Company in Kansas City. The company had 35 employees at that time. Dad had a very successful 37 year engineering career becoming one of the owners of the company. He worked on many famous engineering projects. When he retired in 1972 Burns and McDonnell had about 1,000 employees. Today "Burns & Mac" has about 5,000 employees and is one of the premier engineering companies in the U.S.
My Dad, Earl J. "Tommy" Thomson, was avery dynamic individual. He was married over 50 years and raised me and my sister. He became a water skier, snow skier, yachtsman sailing C scow and E scow sailboats and also piloted ice sailing boats. He retired to Florida in 1972 where for many years he was the captain of his 54 foot yacht. He was also an instructor with the U.S. Power Squadron and became a regional Flotilla Commander in the U..S. Coast Guard Auxiliary. He died in March of 1994 at age 89 and his ashes were spread in Charlotte Harbor, Florida. I don't know if any of this information is of use to you since you refer to Marquette hockey starting around 1970. So that would be more recent Marquette hockey history. But the history of hockey at Marquette certainly does not begin in 1970 with their having won the Midwestern Hockey Championships in 1928, 1929 and 1930. Ten pages pages were devoted to hockey in the 1932 yearbook and my Dad was listed 9 times with 5 photos in the 1932 yearbook. In the 1933 yearbook my Dad was listed 8 times with 2 photos in the 1933 yearbook and was called “The Shutout King with a strong bid for All American honors” and that he played “sensational goal” and often turned away shots “in spectacular style”. It also mentioned that he had attracted the attention of several professional clubs in Canada and was likely to join MacKenzie and McFadyn in professional hockey. 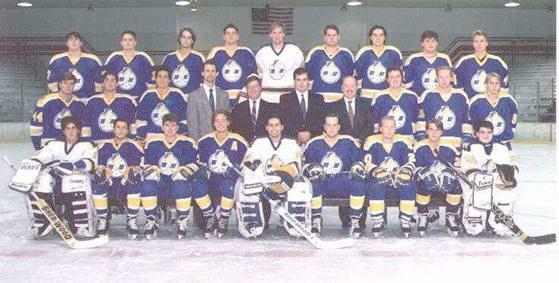 My Dad was elected as an All American hockey player at Marquette. I have his All American crest and I believe it has the date “1934” though I’ll have to take a look at it to verify the year. I suppose that Marquette hockey was also well featured in the 1925 through 1931 yearbooks. The photo at the bottom of the page was taken in the Winter of 1970. The ’69 – ’70 school year was the first for Marquette Univ. Hockey. A new skating arena had just recently been built; that’s where we played. We only scrimmaged among ourselves in the late fall of ’69; then during spring semester of 1970, we played our first games. Our first game was against the Milwaukee Institute of Technology (MIT) which later changed its name to Milwaukee Technical College, which is now part of the Milwaukee Area Technical College system. We played MIT once more that season and another team [I forget who]. Three games … I think we were 3 – 0. There was no professional hockey in Milwaukee at the time; hockey wasn’t that big there yet. Most of the guys on the team were from New England , Minnesota or the Chicago area. I played on a line with two other guys from Massachusetts; we called it the “Bay State” line. Speed skating in West Allis was the big attraction. We sometimes went out to the speed skating oval --- in our hockey skates! --- just for the hell of it. In the old black & white picture at the bottom, I am the second from the left in the back row (#25). 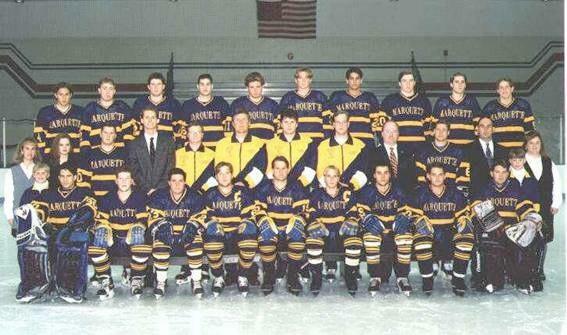 Next to me is David Albertini (#22), my line-mate (and former roommate). We were wearing the club football team jerseys; they were loaned to us by the Athletic Director. All other uniforms and equipment was our own, hence we didn’t match, except for the jerseys. The guy who actually started the team was a graduate student from Rhode Island; I don’t remember his name. I don’t remember the names of any of the others. Since both David and I --- along with a few other guys --- were seniors, we graduated in May. I don’t know any of the history after that … except that when I was in graduate school at Penn State (’85 –’88) --- and playing in an adult league of faculty and graduate students ---, I remember seeing at the rink a trophy from the early ‘80’s where Penn State had won the club national championships [there was no ACHA then] and on the trophy was the score of the final game: Penn State __ and MARQUETTE UNIVERSITY __; so Marquette must have gotten pretty good between 1970 and the early ‘80’s to have made the national finals! I had also heard that for a time Marquette had disbanded its club team. I am Bill Brown and I am in the picture at the top row right side. I entered MU in the fall of 1970. That was the first year MU actually played games against other schools. In the 1970-1971 school year we were 6-0. The goalie in the picture is Dennis Butler. Dennis was the "founder" of the program. The 70-71 year was his senior year. The game against NIU was played at Wilson Park, a rink on the south side of Milwaukee. At that time we did not have uniforms. We borrowed the club football uniforms for our 6 games that year. Any way NIU comes to Milwaukee in their own bus with a second bus of fans from their school. It was comical as we watched these guys get off the bus. We realized this program was way ahead of where were at that time.NIU takes the ice looking like the BlackHawks. They had the Chicago road white uniforms. Their uniforms cost more than our entire budget that year. My name is Bob Sarver, journalism 84, and I can barely stand on skates. But as a freshman on the fourth floor of Schroeder Hall, I was recruited by floormate Joe Tafuri to run the scoreboard at Wilson Park Arena for Marquette hockey. I did that job for four seasons. Mark Richardson, another freshman and fellow WMUR “employee,” was right next to me for 4 seasons as public address announcer. Another freshman, Bob Laird from New Jersey, would do play-by-play from 80-84 from the rather small press box right behind us. Part of the team’s budget from student government was yellow school bus service from campus to Wilson Park. Most of the players were either from the Chicago area or New England, but I do recall a pretty decent forward from St Louis. The coach, as well as the two officials for every home game, were former Milwaukee Admirals players. And yes, there were only two officials, it was a much slower paced game then you see today. Speaking of the Admirals, once every season, Admirals owners Lloyd Pettit and Jane Bradley Pettit would show up at Wilson Park for a game. They would sit in the press box, not calling any attention to themselves. I remember the first time I went up there between periods and introduced myself, I referred to them as Mr. and Mrs. Pettit. Mr Pettit replied “please, it’s Lloyd and Jane.” They were the nicest most down to earth people! Of course they went on to donate the money for, and build, the Bradley Center in hopes of getting an NHL team for Milwaukee. It is very sad to me to see that that building is now gone. At least there’s still the Pettit Ice Center at State Fair Park. I believe the name of the league that Marquette played in was the NCHA, but I’m not positive. That is the name of the current league Saint Norbert plays in. Saint Norbert was our arch rival in hockey. I remember we would always try and guess how many penalty minutes there would be prior to a Saint Norbert game, and if anybody would get thrown out on a fighting or misconduct. There were 8 teams in the league. Marquette, St Norbert, Lawrence, and UW-Whitewater in state. Northwestern and Illinois from the Big Ten, Iowa State from what was then the Big Eight, and Alabama-Huntsville, which is now a D1 program. We would also play Notre Dame, but I’m not sure if that was their JV or a club team. Their varsity was in the CCHA I believe at the time. We would always in the season with a single home game against Wisconsin’s JV, and every year that came follow the same script. It would be close after two periods, and then the Badgers would pour it on in the third. The Warriors look like they were skating in cement. It makes a difference skating two hours a day versus two hours a week! Very glad to see there is still hockey at Marquette! Ring out ahoya!